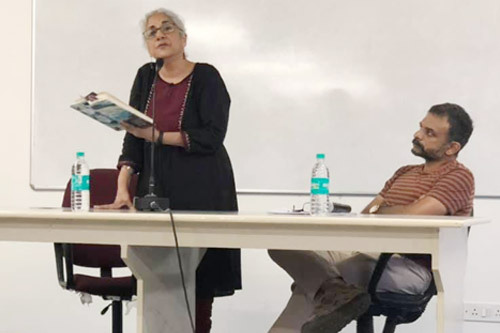 Writer, editor and activist Githa Hariharan spoke about her latest novel, ‘I have become the tide’, published this year by Simon & Schuster India. The book was released by Carnatic music vocalist and author, T.M. Krishna, at the Asian College of Journalism on April 5, 2019. The book revolves around the lives of three Dalit students and a history professor, who wishes to establish the low caste lineage of an ancient and venerated poet-saint. The novel addresses the issues of caste discrimination, both past and present, as well as the crushing of dissent in our own age. The book release was followed by a discussion with the audience and a reading of selected excerpts from the book.